Actual garment measurements: 79-113-146,5 cm / 31-44.5-57.75 inches. Garment is intended to be worn with quite a bit of positive ease: 10-15 cm /4-6 inches is recommended. Sample shown is size M on a 94 cm / 37 inch bust. There are only 3 sizes between which the span is pretty large – this is because of the nature of the Feather & Fan pattern and the number of repeats. You can’t just size the pattern up or down by adding or subtracting a number of repeats. However, some testers have successfully substituted heavier yarn weights (and larger needle size), thus scaling up one of the sizes given. Check your gauge before you begin, so you can calculate the final size! In order to keep the garment looking the same in different sizes, I calculated the sizes upon a modification of the feather & fan pattern (being a repeat with either 4 holes, 6 holes, or 8 holes). There is a difference of 6 stitches per size – and with the lace pattern being repeated 7 times across the garment, the total difference in width is 42 stitches. 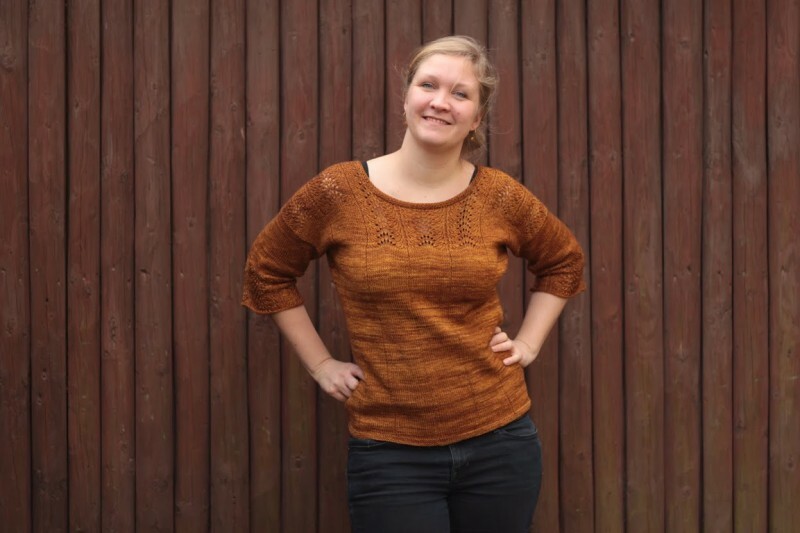 For bust circumference of the sweater that makes 84 stitches difference per size! Yes, I did think about doing the grading for different sizes in another way, by for instance omitting a repeat of the feather & fan pattern or adding one. But doing that would affect not only the width of the garment, also the size of the neck opening and the final look of the sweater. It would complicate the pattern too much too my liking, so I chose this method. However, there are ways to get around these very limited sizes! 25 (pattern stitch gauge) / 20 sts (your stitch gauge) = 1,25.
divide the pattern stitch gauge with your stitch gauge. This means your gauge will give you a finished garment with a bust measurement that is 1,25 times as large as the one in the pattern. 36 (pattern row gauge) / 30 (your row gauge) = 1,2.
divide the pattern row gauge with your row gauge. 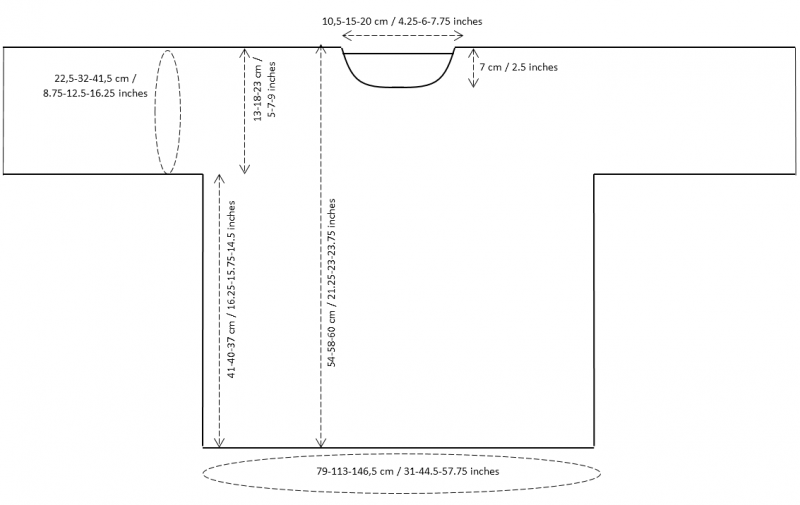 Your neckline depth will then be 1,2 times deeper than the one in the pattern – in this case 8,4 cm / 3.25 inches. It most likely won’t be a big issue, it’s just something you need to be aware of if you like your necklines to be at the high end. There are ways to remedy it; Work a couple less lace repeats over the shoulders, or add some extra rounds to the neckline finishing. Personally, I used to hate swatching and found it the worst chore ever. But in situations like these, I am happy that it is an option! 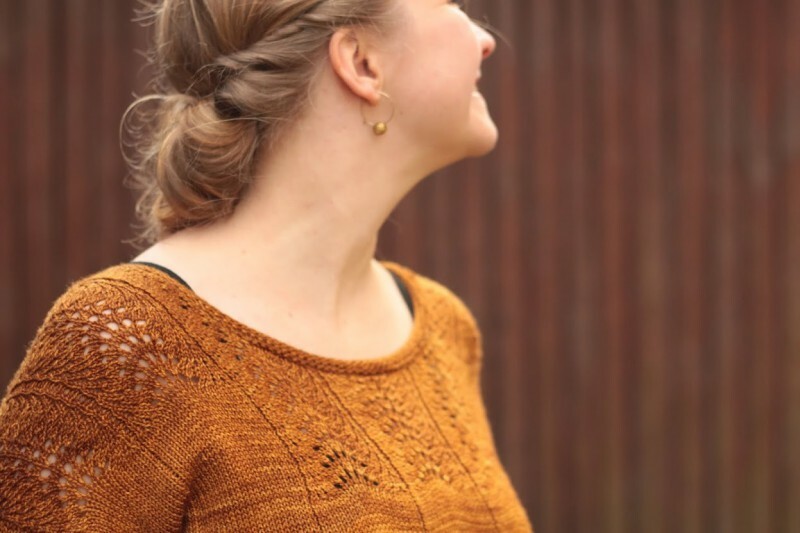 Take a look at the Ravelry pattern page for Feather & Fan-tastic, or you can directly buy the pattern right here. In October last year, I watched an episode of season 5 of Downton Abbey in which Lady Edith was wearing a sweater which I immediately fell in love with. I didn’t find many good images of it, so I took some screen shots, and decided this should be possible to deconstruct. There was some feather & fan lace, no real shaping, drop shoulder sleeves… Couldn’t be that hard, right? 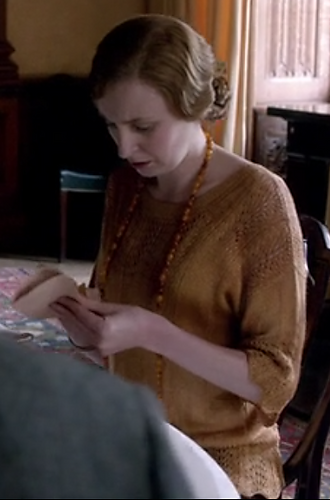 Screen shot of Lady Edith wearing this sweater in Downton Abbey, Season 5, Episode 6. From itv. I did a lot of calculating, ending up with something which looks a lot like it, but not really being identical. Regardless, I am in love with this one! It is the perfect garment for when you want to dress up a bit, but at the same time can act as casual wear. Being someone who tends to fall into that last category a lot, the former option is great, as it just depends on what I combine it with. 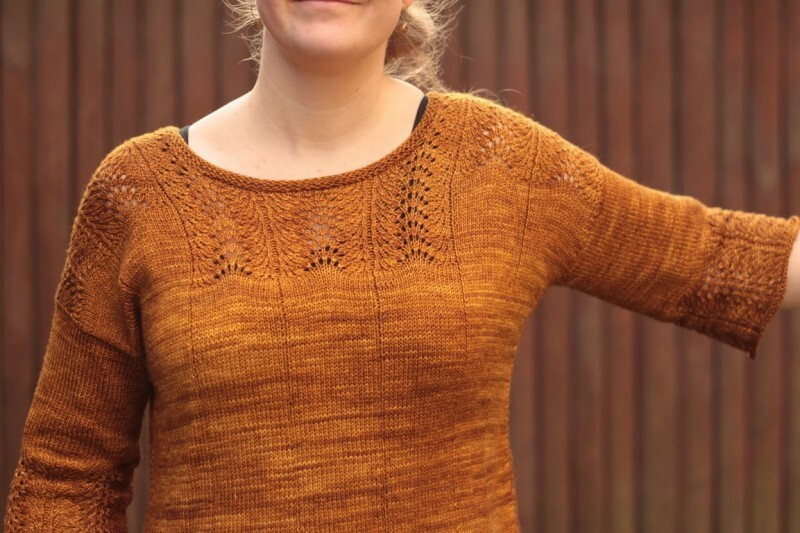 The yarn (Madelinetosh Tosh Sock) combined with the color (Glazed Pecan) made for a very enjoyable knit, as I kind of drooled over it – and the sweater itself consists of good stretches of stockinette stitch with the feather & fan lace portions spicing it up a bit. The body is worked flat from front to back, dividing the work in two when reaching the neck opening. After knitting the shoulders, the two halves are combined again when casting on stitches for the back of the neck. 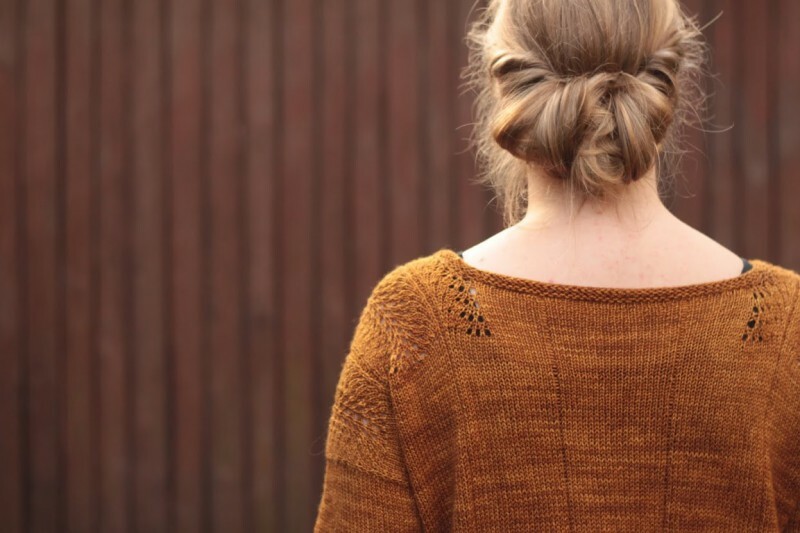 The sides are seamed using mattress stitch – the side seams are almost invisible, as they look like yet another little purl ridge like the ones in the stockinette body. 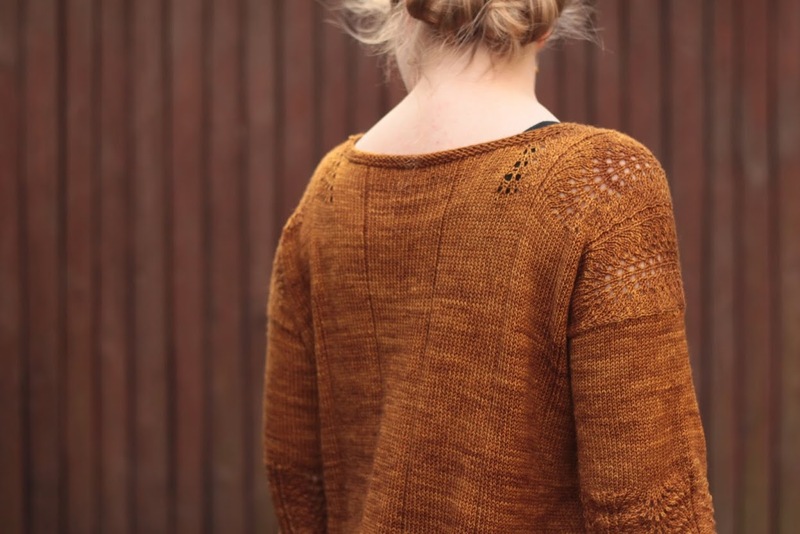 Stitches are picked up along the armholes and the sleeves are worked top down, ending with a delicious little bit of lace. To finish it off, stitches are picked up along the neckline and a couple of rounds are worked in garter stitch to give a neat edge. The feather & fan lace pattern helps shaping the neckline. Do you want to join in knitting this one? 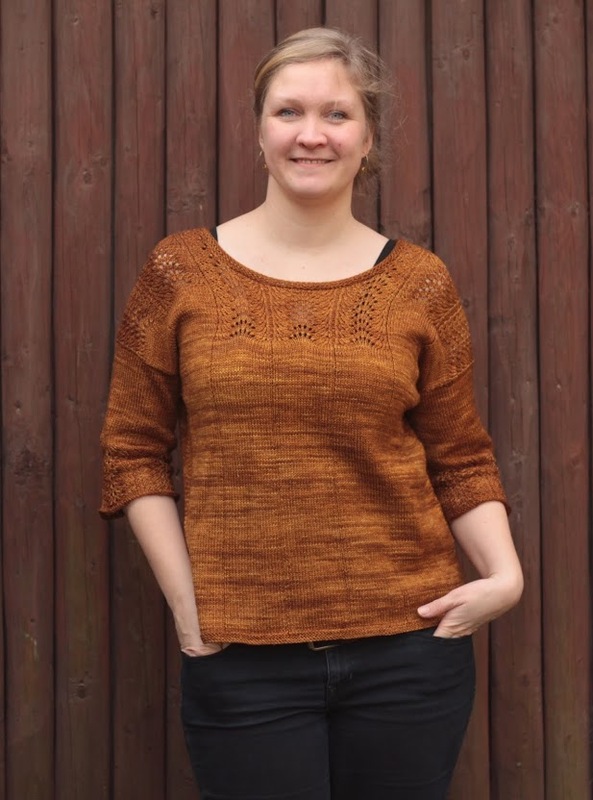 It’s for sale right now – and until end of day March 16th (Copenhagen time), all Ravelry purchases of the pattern are 25% off if you use the code “FAN-TASTIC” (no quotes) upon checkout. Furthermore, if you’re attending Edinburgh Yarn Festival this weekend, keep an eye out for me. 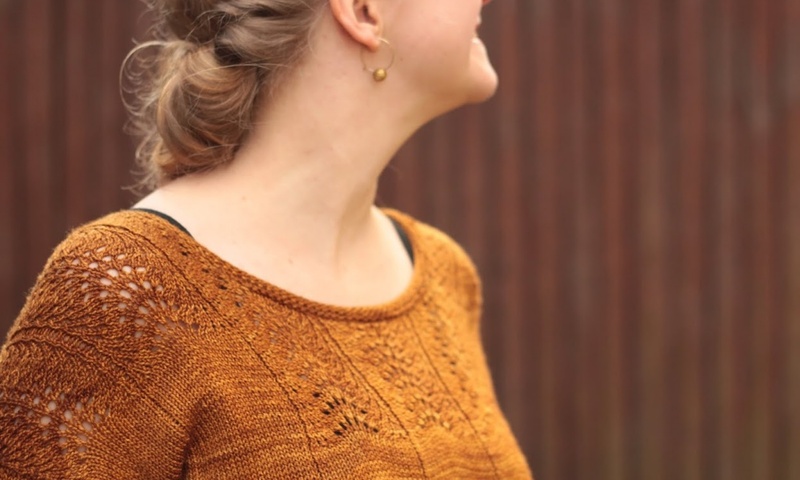 I will be wearing this one on Sunday, and if you spot me and say hello, I’ll be happy to give you a coupon code for a free download of this pattern! I’m so very much looking forward to the festival!